On Friday 29 November 2013, a Police Scotland helicopter fell out of the sky and landed on to the Clutha bar in Glasgow. Three people in the helicopter and seven in the bar died. Many more were injured. The cause of the crash has still not been identified although a report is due in January. The Clutha is closed and remains almost exactly as it was after the emergency services left. For the people who were there, and for their families, the memories of that night never go away. Dougie Naismith was in the bar when the helicopter crashed. He had been drinking with his friend, Eddie Waltham, in another pub in town but left in search of live music. When he entered the Clutha, Dougie was met by a 'wall of noise'. This was Ska band Esperanza who were playing to the packed pub which often hosted live music. He doesn't remember leaving the bar. Dougie, who was a firefighter before he retired, had experience of being in unsafe buildings but on that night even he was scared. He said: "Sometimes you go into a building and it's dark and it's dangerous, there's holes in the floor, the fire is raging, but there's no experience like we had there. "I had no control, I was extremely afraid. I just looked round. I've done many dynamic risk assessments and I can tell you what's safe and what's not safe. That was not a safe place to be." By this time his friend Eddie was outside the pub not knowing if Dougie was alive or dead. Inside, Dougie was trying to use his years of fire brigade experience to keep the other trapped people calm. He said: "I tried to assure them that help was on its way and we would hopefully all get out of this alive. "I took stock of the situation and realised they were actually in very, very serious danger as there was a large amount of debris above their heads. "I tried to remove some of it but it was too dangerous, it started to fall down on them so I stepped back." A year on Dougie is waiting for a hip replacement. He broke his shoulder and suffered injuries to his neck in the Clutha as well as suffering psychological trauma. He said that if he hadn't been standing where he was, things might have been different. "I'm one of the very, very lucky ones, no-one's got to tell me that," he said. Media captionEddie Waltham was heading to the Clutha: "It was a pint away"
Eddie Waltham was the friend that Dougie Naismith had been drinking with in town. The pair of retired firefighters were disappointed by the disco that was on in the bar they had chosen. They wanted to hear a band. But Eddie had just got another pint so Dougie left without him. Eddie said he would catch up. His decision to have another drink was perhaps what saved his life. "I was just at the flats down the road, maybe 100 or 150 yards away when I heard the massive thump of what turned out to be the helicopter landing on the roof." Initially Eddie thought there had been a collision between two lorries, but when he looked up he could see that wasn't what had happened. He said: "I could see what appeared to be a large ball of smoke rising up into the sky and I knew very quickly that it was coming from the Clutha. "My reaction from that point was, 'Dougie's in there, and I'm heading in there to get him'. And I just ran, immediately to the pub." For a while Eddie didn't realise it was a helicopter that had crashed nor did he know what had happened to his friend. He said: "As I ran I could see people running out of the right-hand side door and not the left. "I realised whatever had happened, most of the damage was on the left. And I also realised, that given that I go in the left hand door, Dougie would probably be there." As Eddie helped with casualties, the emergency services started to arrive and one of the firefighters recognised him. He told him that Dougie, also an ex-firefighter, was inside. Once Eddie and other members of the public had been moved away from the scene, he still hadn't heard anything about Dougie. Eddie said: "One of the fire service, I'd worked with his dad, and I heard him shouting, 'Eddie! We've got Dougie, he's alive!' And it was fantastic. I was elated. I thought he was gone. "I was standing there thinking about what I was going to say to his wife and his kids and I was told that." Alan Crossan is the owner of the Clutha bar. He was at home recovering from a heart attack when he got a call to say that the roof of the pub had fallen in. Then a few seconds later he got another call saying that it was a helicopter that had crashed on to the pub. He was on the scene in minutes. He said: "It's unbelievable what happened and it's very hard to understand. 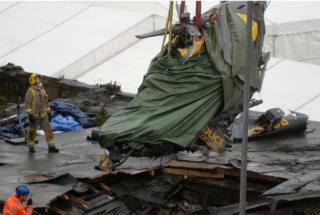 A helicopter came through the roof of a busy pub and lives were lost, it's hard to understand." The pub is still in a state of disrepair but structurally it's safe and Alan hopes to start work on the building soon. He said: "You get all sorts of opinions from different people. Some people saying, don't open it again, some people saying, please open it again. "We'll definitely open the Clutha again, but what form we open it in, I think we maybe need to evolve into that. "We'll maybe need to take baby steps to find out the next stage with it. I think that's the best scenario for it." Scottish Enterprise have a re-development plan for the area that the Clutha is in and Alan hopes regeneration will mean a positive legacy for the bar. He said: "As I've always said, the building of the pub's not that important, it's the people who go to the pub. So if they come back in, they'll make the Clutha again so hopefully that'll happen." As Police Scotland chaplain for the Glasgow area, Reverend Neil Galbraith is often the person people turn to in a time of crisis. He was on the scene of the crash within about 15 minutes after his son phoned to tell him what had happened. The Clutha was a particularly difficult incident for Police Scotland. Not only was it an horrific accident but it involved three of their own. Police constables Kirsty Nelis and Tony Collins were in the helicopter along with pilot David Traill when the helicopter crashed. All three of them died. Reverend Galbraith said: "Clutha is not a closed page for Police Scotland. It is never forgotten. None of these events are forgotten. We just move on with a quiet dignity and show respect to them in our own way. "There's an expectance the force will respond with the most professional and exacting of manner which it will, but the force is made of human beings and if you take that humanity away you remove and awful lot of the value that's there already. "So you must allow us to have that moment when we take time to remember." Reverend Galbraith, like many of the other people connected to the Clutha, acknowledges the role the city played in the aftermath of the crash. He said: "The city was brilliant during this whole period but I think the city is now at a point in time where it's looking to say, in the most dignified fashion, we do want to remember, we don't want to forget. "But we don't want to turn it into a media circus. I wrote recently that there were no heroes that night, there were a city of heroes."